The post below is one of the very first articles I wrote on this site and it conveys how we got into massive debt… twice. This is our debt story which was written in January 2013. It’s been 14 years since debt crept into my life. Probably longer than that for my husband. For me, it first started with a small catalogue debt of about £300 with an interest rate of 32% APR. For my husband, it was a snowball of little debts, car finance and then consolidation loans. We were both in debt when we met, although we didn’t know the true extent of it until we bought our first house. Just after we moved in, my now husband lost his job and we couldn’t make the credit card repayments. Back then we had our own bank accounts so I didn’t know how much my husband was actually paying on debt and I don’t think he knew either! When my husband lost his job in 2003, the reality of the debts hit us. At this time, the total debts exceeded £35000, not including our mortgage. We told our close family and friends and they were really understanding, telling us not to bother buying christmas presents and coming round to our house for nights in. We went to the bank for help, unfortunately there was nothing they could do except advise that we went bankrupt. As we had just got a mortgage on a house, we wanted to avoid this at all costs and so began the process of paying debt back. We literally lived on the bare minimum for a year or so and paid a small amount back. We never went out and spent weekends doing car boot sales. Unfortunately in a way, we both got better jobs and therefore started having more disposable income. Instead of overpaying the debts right through to the last payment, we started enjoying life again, going on a couple of holidays and we decided to save up to get married. Luckily, we didn’t get into debt for that. This meant the minimum repayments were being made on our debts and our credit score was pretty good. Looking back, I think we were so desperate to get back to normality, this could have been our worst mistake along the way. It still hung over us like black cloud, always there in the back of our minds. In 2009, just after our wedding, my husband had a great opportunity to start his own business with a good friend. This meant taking a large cut in salary by 10k per year. With me still earning a decent wage, it seemed like we could manage. We still had separate bank accounts and everything was going to plan, so we thought. We fell pregnant with our first child and I saved up enough money to live pretty much as we were whilst on maternity leave. It was whilst I was on maternity leave in 2011 that debt hit us head on again. One night my husband confessed that he had been spending on credit cards again. This time it wasn’t frivolous spending, it was generally expenses for the new business. It was completely out of control. He had already spoken to a Debt Management Company who were in the process of writing to all his creditors to explain the situation we were in. Now, just over a year on from this, we make one monthly payment each month to pay off the majority of the debt and another couple of small payments each month on a couple of credit cards I’ve had for years. Things are dreadfully tight. I’m now on a fairly low income now due to a change in work circumstances and my husband is still earning the salary that he started with the new business. We now have one joint account which all income and outgoings go out of, for us this is the one thing we definitely should have done years ago. When I think back to how long this has been going on for, I wish we had taken control back in 2003 and actually stuck to paying off the debt. 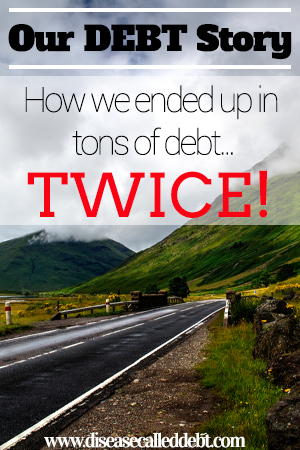 We could have been debt free in 3 years based on the salaries we were earning. Maybe even earlier than that. This debt is like a cancerous disease, growing, then stopping, then growing again. It is a disease that we have brought on ourselves, we are not trying to escape this fact! We need to get rid of this debt once and for all, if we are ever to lead a happy and secure life financially. Sometimes, I feel like I can’t breathe knowing the amount of debt we are in and how tight it is for us every month. The only way we will become debt free is to pay the debt off. We are now taking the first step, to review exactly how much money we owe and face up to this debt. I will post again with the details, but having had a rough estimate, I think it will be in excess of £35000 again. I know some people reading this blog will be wondering how on earth we racked up so much debt over the years. I know some people will think we have been so stupid and selfish. The truth is, we were embarrassed and wanted to live normal lives – we didn’t even want to admit the amount of debt we were in even to each other. Most of our friends and family now still don’t know how much debt we’re in. After 22 months, we finally cleared our debts of just over £41K! Since then, we have been (and still are) working really hard to save money to meet our new financial goals of buying a home and planning for retirement. New to Disease Called Debt? Take a look around this site, you may want to start here. Thank you for taking the time to read our story and feel free to share your own debt story in the comments section below! Please consider subscribing by email to be kept updated of blog updates!